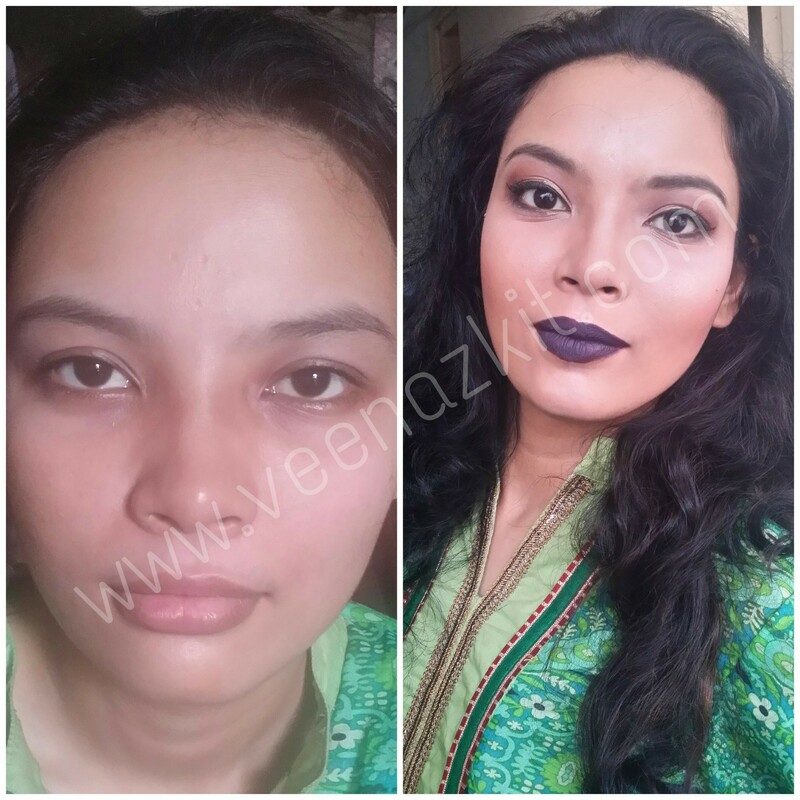 Finally we are here today for the last segment of the Makeup Series for Beginners and I had a step by step post on how to apply makeup a month ago and split it up into different segments. Foundation Routine, Eye Routine and today we have the Lips Routine. You will find below how I apply my lipstick/lip gloss and what steps I follow when preparing my lips for that. Exfoliate lips- Make it a habit to exfoliate your lips. Lipstick makes dry and chapped lips more visible hence to avoid that, exfoliate regularly. While there are many lip exfoliators/scrubs available in the market, I use my very own home-made lip scrub. Do you want to make your own too? Click the picture to know how. 2. Condition Lips- Always condition your lips. Keep it hydrated all the time to avoid gross flaky dry skin. There are plenty of lip conditioners and balms in the market and one very reasonable option for that is Vaseline also known as Petroleum Jelly. You do not have to spend a fortune on lip balms. You can find it in all price range. My favorite lip balm at the moment is from Utama Spice. click the picture below to know why. 3. Line lips- Lining my lips is very important for me. By doing this, I am giving my lips a more defined shape and outline at the same time prevents lipstick from smearing around lips. Make this a habit and always include in your makeup routine. Use lip liner that matches your lipstick shade ,if not the closest. Lip liner suggestions: Get any lip liner from drugstore to high-end, it doesn’t really matter as they perform the same way. I have from NYX, Essence, NARS, Misslyn etc. 4. Apply lipstick / lip gloss- Last step is to apply your desired lipstick or lip gloss. Lip products come either with matte or glossy finish. It is totally on you which you prefer. 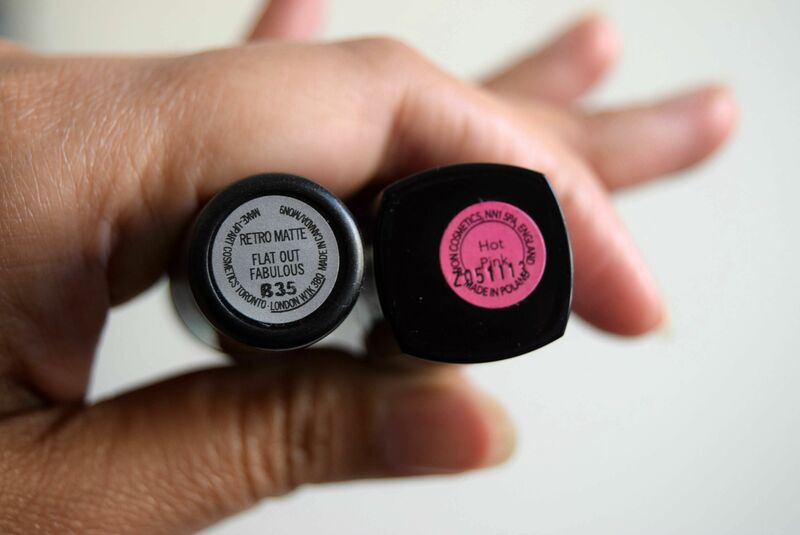 Nowadays I am more into matte lipsticks as I find them more long-lasting and they hold on to your lips very well that they don’t smear all over. I like the look of matte more but occasionally I love wearing my glossy lipsticks too if I go for light eye makeup , I like keeping my lipstick dark and shiny then. The same way, Lip glosses nowadays have come in matte formula and is very much “in” and are commonly known as Lip cremes. L.A Girl matte lip pigments are my favorites. Click the picture to know why. While lip cremes are ruling over the beauty world currently, one cannot resist the charm of lip gloss. The touch of that shine is what a girl needs most of the time. So always experiment and understand what you like. As I mentioned earlier, there is no rules to makeup. 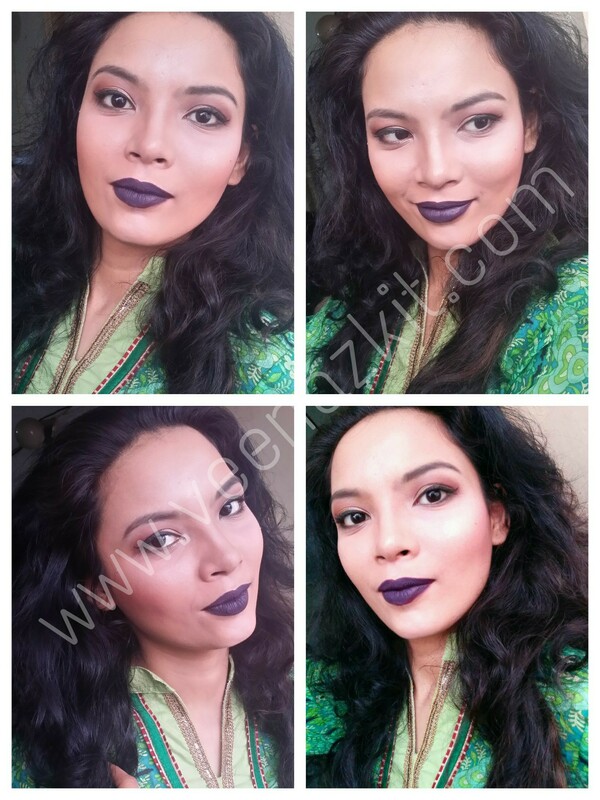 You can even give your glossy lips a touch of matte by following this method. Lipstick/lipgloss suggestions: NYX, Maybelline have very good options of lip products both matte and glossy , however you can find equally good in other brands like L.A Girl, Sleek, Mikyaji, Givenchy, Anastasia Beverly Hills etc. Other lip products such as lip primer and lip concealer are very unnecessary in my point of view. Apply your lip liner all over lips , it will act as base for your lipstick and will cover your lips’ natural pigmentation acting as lip concealer. 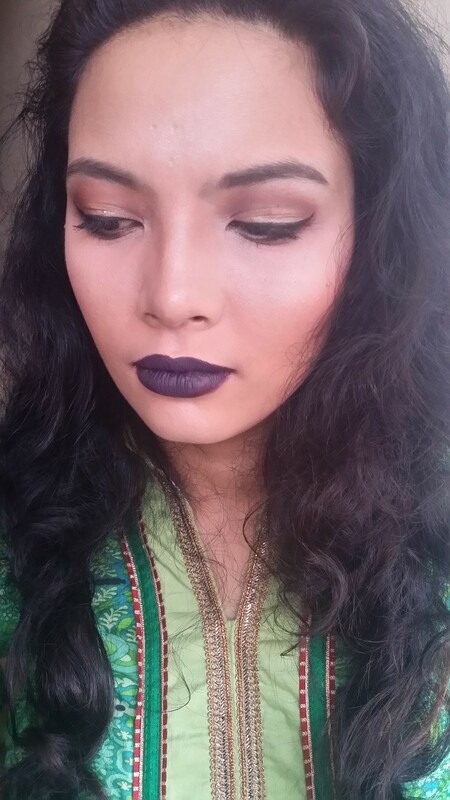 I wanted to use my L.A Girl matte lipgloss in Black Currant and so I did a subtle eye makeup to go along with it. *Different shades of brown from Morphebrushes eyeshadow palette. Wgat do you think of this look ? 😊 Do you fancy the lip color? I just realized that I have a lot of pinks in my lipstick collection and some actually look so the same. So I swatched and remember the M.A.C lipstick I spoke about in this post, the Flat out Fabulous lipstick actually has similar shades with me. Hope this might help someone looking to own MAC lipsticks but can’t afford, you need not worry and get yourself the affordable version of the lip product. The color is almost the same. Specially when on lips , you will only find out by the texture as MAC is purely matte while Avon lipstick has a little bit of sheen in it. Both lipsticks are not long lasting and the only way you can make it last longer is through this method. 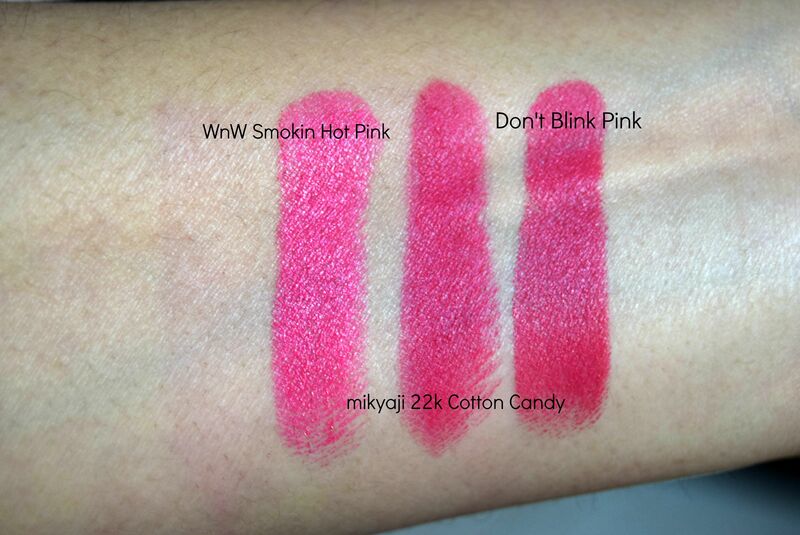 Wet n Wild Don’t blink pink is definitely the dupe. Both M.A.C and Wet n Wild lipsticks’ performance and texture are the same however Wet n Wild lippies lasts longer,way longer than M.A.C. 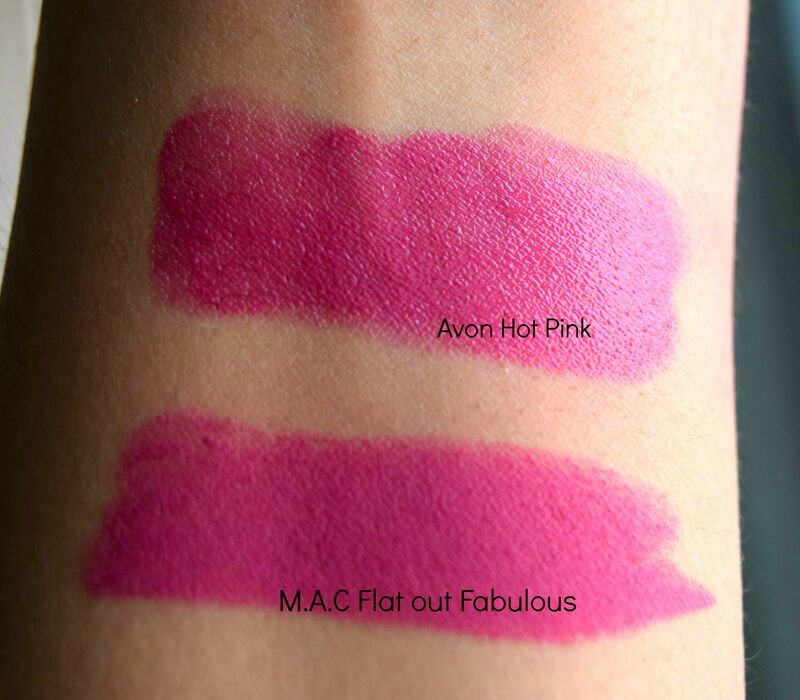 MAC lipstick is a matte one while Avon isn’t so you can see the difference in their texture or finish. 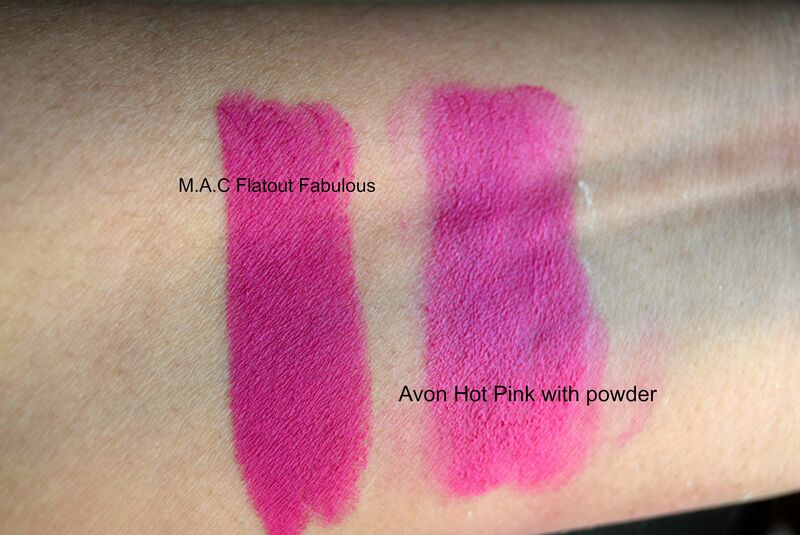 Avon appears to be a bit glossy but it isn’t really that glossy but not matte too as MAC. So what I did was dab a little bit of powder on the Avon lipstick to make it matte and see if the colors are still similar. so our dupe lipstick here has become lighter pink. so I guess if you want to have the same color as MAC then leave it as it is and don’t mess with the finish. Some more of the pinks in my collection which I found very similar to the MAC lipstick and these 3 lipsticks are all mattes. Hope you find this post helpful, if so , do SHARE!